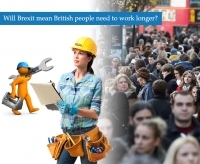 Will Brexit Mean British People Need To Work Longer? As Britain prepares to leave the EU, a new report from the Oxford Institute of Population has suggested that a fall in the influx of EU migrants may lead to British Citizens having to work for longer. The dramatic reduction of EU workers would mean the retirement age for British people would need to be increased in order to offset the tax deficit. The age of retirement is already set to increase, largely due to increased life expectancy and a large number of retirees. However, Brexit would cause the number of migrant workers to fall dramatically and this could increase the age of retirement by 18 months. Speaking to the Guardian, the Chairwoman of UK research into ageing societies Sarah Harper, stated that if Brexit lead to a fall of immigrant EU workers, British people would need to prepare to work longer. Many advanced economies have tapped into migrant workers to address the gap between workers and older dependants. And if this supply of workers was to be cut off, there would be a significant reduction in GDP output. Sarah Harper’s claims are based on a zero net migration but any reduction in incoming migrants would have a very significant impact on output. And it is not only productivity that would be effected by a decreased number of migrants. Harper went on to claim that the UK would see a fall in the birth rate, as women from overseas who reside in the UK have a much higher birth rate than those born in the country. A fall in birth rate would mean the UK would have an ageing population in line with Italy and Greece. The UK would then be subject to the same economic and social problems that these populations are already facing. At a recent conference held by the International Longevity Centre UK, John Cridland who monitors the state pension, stated that Brexit had caused affordability to come into question. And even without the added factor of reduced immigration, the ageing population means that the number of dependants per working adult is on the rise and pension age could rise up to 70. Alongside concerns about an increased retirement rate, immigration would also have a detrimental effect on the supply of social care workers in the country, particularly in London. Much of the social care workforce is made up of EEA migrants and without these workers there would be a lack of people willing to take care of a population that is quickly ageing.